It is wise to think well in advance about the soil you are going to be planting your rose into. To begin with it is good to know a little about your soil type. Is it sandy, chalky, clay or loam? On the whole roses love clay, enjoy a well-balanced loam, tolerate sandy conditions but will struggle in chalk so soils of the latter two types will require conditioning. It is also useful to know the pH of your soil. pH testing kits are readily available and are inexpensive, therefore a good investment. Roses prefer a neutral to acid soil, a pH of around 6.5 but are very happy on the margins of this. A PH of 7 or below indicates an acid soil and will require the addition of garden lime or mushroom compost to help redress the balance. Likewise an alkaline soil will require improvement. Well-rotted farmyard manure is ideal but not always readily available. Peat is also good but as a finite resource should be avoided if possible; there are some very good peat substitutes available instead. Soil should be well dug in advance and it is at this stage that any additions can be made. Please be aware that bare root roses are tied together in bundles and if ordering several roses they may arrive mixed. When your roses arrive please separate your roses carefully before planting by cutting the string. Be careful not to plant bare root roses if their roots are dry or during heavy frosts. When your bare root roses arrive there will be sufficient moisture within the packaging to ensure that should they arrive during heavy frosts or snow they will not come to any harm if left unopened for up to a week. If the bad weather persists for any longer than a week then we recommend either ‘heeling them in’ or placing the roses still tied in their bundles into a container of damp compost. If the roots of your roses appear dry they will need to be re-hydrated by submerging them for up to 2 hours in a bucket of water. If your bare root rose order arrives in a period of heavy frost it is going to be very difficult to plant it. Therefore, in preparation for its arrival have an area of soil covered with an old piece of carpet or something the frost is unlikely to penetrate, in which the rose maybe ‘heeled in’ until it is able to be planted. When it arrives dig a trench deep enough to cover all the roots. Lay the rose against the side of the trench on which you have mounded the soil and simply dig more soil over the roots, compressing the soil as you go. Before planting newly purchased bare root roses we would always recommend hard pruning them first. This promotes basal growth, which will help to create a better structured plant. Shrub roses, Climbers and Ramblers will benefit from being hard pruned to six inches and Bush roses should be reduced down to about four inches. It is also worth noting that shrub roses shouldn’t be planted any closer than about two foot (60cm) apart. Click here for more advice on rose pruning. 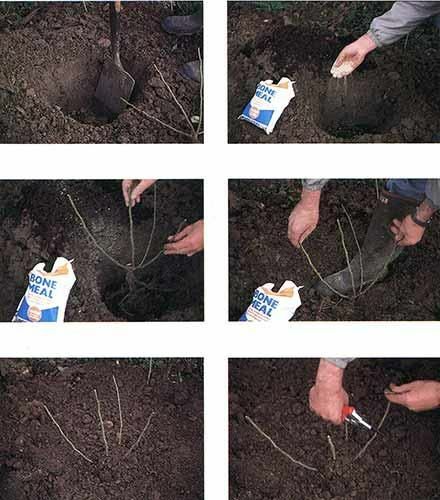 To plant a bare root rose make sure that the hole is wide enough for the roots to comfortably spread out and deep enough so that the graft point (union) will be approximately an inch below soil level. This is to reduce the risk of suckers developing and damage from high winds. At this point we would recommend using Peter Beales Roots Boost, which contains essential ingredients for robust rose growth and increased nutrient and water uptake, for healthier plant performance and suppression of soil borne diseases. Click here to shop Roots Boost. Roots Boost should be sprinkled in the planting hole so that it comes into direct contact with the roots when planting any rose. The friendly fungi will attach to the roots of the plant making it easier for them to uptake the essential nutrients and water needed for initial healthy growth. If using a proprietary rose food or bone meal instead of Roots Boost, then no more than a handful is required and needs to be mixed in with the compost, as direct contact could cause scorching to the roses roots which will actually cause far more harm than good. You are now ready to place your bare root rose in the planting hole. Hold the rose with one hand, to ensure that it will be planted at the correct planting depth and that its roots are spread. Start to add the compost mix to the hole until it is approximately half full. The rose can now stand on its own and the soil can be firmed with a heel. Continue to fill the hole and firm as required. It is important to firm the soil around your newly planted rose to make sure that there are no air pockets present around the roots. Don’t forget at this point to make sure that your rose is labelled! It can be incredibly frustrating when you can’t remember what your beautiful new roses are called. Especially if you want to recommend them to friends. NB: We further advise that if weed supressing mulch is to be used, DO NOT USE WOODCHIP, but a composted materal such as strulch (straw mulch or composted bark). If used, we have found that it acts as a barrier and stops the rose from receiving the required nutrients, giving you a rose with lots of greenery, but no buds. If possible the ground should be prepared well in advance, dug deeply and dressed with well-rotted farmyard manure, compost or other organic material and bone meal. Never use fresh farmyard manure and never allow any sort of manure or fertiliser to come into direct contact with the roots when planting. 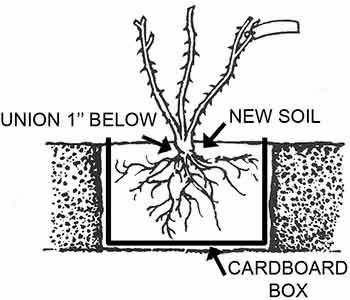 Ensure the hole dug is wider and deeper than the container in which the rose is growing, with the bottoms of the branches around an inch below soil level. When removing your rose from its pot we would recommend leaving the root ball intact, instead of teasing the roots out, as this could damage the young rose’s delicate root system which needs time to establish. There is no need to tease the roots out but better to leave the root ball intact. We would also advise that if a rose is purchased before June to leave it in its pot until after this time to give the roots time to establish and bind with the surrounding soil. 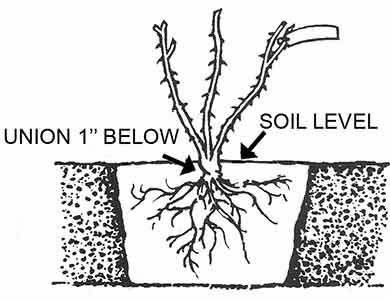 With the plant upright carefully replace the soil, remembering to ensure that the first inch or so of the branches are below soil level. Then firm gently with the feet to ensure that there are no air pockets around the roots. Water well. Don’t forget that container roses planted in the summer will require regular watering. For more advice on feeding and watering click here. Choose a large container with good drainage holes. As a rough guide, for smaller shrubs which grow up to 3ft, use pots with a 14 – 16 inch diameter. For larger ramblers and scramblers use pots with a depth of up to 20 – 22 inches. As with planting roses into the ground the base of the stems should be just below the surface of the soil. If using a ready-made compost use a loam-based one if possible, (such as John Innes No.3). Always add drainage to the bottom of the pot, shingle is fine, roses hate to have their feet in water. Allow at least two inches between the top of the pot and the compost level, for ease of watering. Remember that pot grown roses will need regular watering during the summer and should be fed with high potash, liquid, fertiliser, every two weeks throughout the growing season. Every year when the rose is dormant during January or February, compost should be scraped away to a depth of a few inches and replaced. Then, after approximately three years the dormant rose should be removed and all the compost replaced. To do this remove the rose from the pot, gripping it near the base. Most of the compost will come out with the roots. Carefully knock away any loose compost and tease out the roots with your fingers before re-potting. The general rules for planting roses must be followed but it is important to stake standard roses. The stake should be in position before the rose, about 18” into the ground. The standard should then be tethered to the stake using at least two ties. One as close to the crown as possible and one about halfway down the stem. Ensure that the ties have spacers positioned between the stem and the stake to avoid rubbing. If planting in an exposed area it is a good idea to position the stake on the side where strong winds are most likely to come from. This will hopefully mean that the main force of high winds will hit the post first, reducing the risk of damage to the standard rose. Prepare the area well. Prune the rose as hard as possible, leaving some younger wood. When digging up the rose, try to retain the soil as a ball around the roots. It is likely that some roots will be damaged in this process but as long as most of the fibrous roots remain intact this should not cause too much concern. Plant with care, being careful not to break up the root ball when treading the soil down. Water well and thereafter, regularly to help the roots establish quickly. Rose sickness or specific rose replant disease occurs when a new rose is planted where a rose has previously been growing. This means that roses should never be planted directly into the ground where an old rose has just been taken out, unless the ground has been treated, replaced or given sufficient time to rest. If you are looking to replace an old rose with a new one then it is advisable to allow the ground a period of at least six years before planting any new roses or alternatively replace a significant amount of soil from where the original rose had been growing. However, a simpler and more effective solution is to dig a hole large enough to contain a good sized bio-degradable cardboard box. Place the cardboard box into the hole and plant your rose within the box to the correct planting depth, filling it with entirely NEW soil or compost. By the time the bio-degradable box begins to break down the surrounding soil will have been given sufficient time to rest and the effects of rose replant sickness will be avoided. If a new rose was to be planted directly into untreated soil, it’s likely to be stunted, will produce fewer and fewer flowers each year and generally look in very poor health. Please be aware that rose replant disease isn't always instant either, it is possible for a new rose to seem perfectly healthy within it's first year, then suddenly start to look sickly thereafter, becoming increasingly worse.